This year’s Fall Senior Pet goes to Duke and Reba Hagerty. 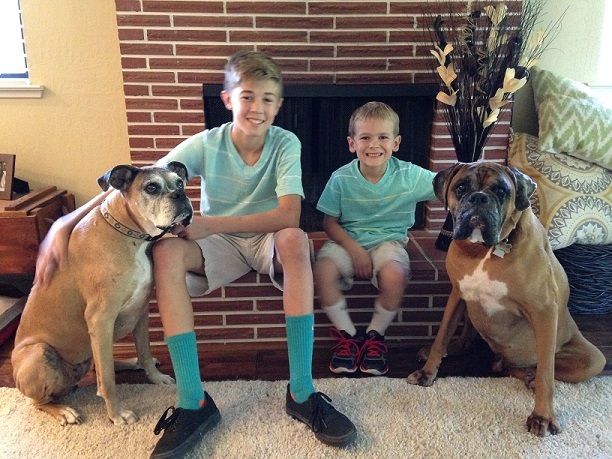 These inseparable boxers became a part of the Hagerty family about 3 years ago. The Hagerty family, fell madly in love with these two droopy-eyed, slobbery kiss-giving pair, and decided to adopt them from a family that could no longer care for them. Duke and Reba have been a wonderful addition to the family ever since. At first Duke and Reba seemed to need some socializing and medical attention. Together, the Hagerty’s and BCPH have been taking good care of the pair. Both Duke and Reba have participated in our Senior Care Program; this is the best way for our doctors to find and oversee any health issues. Duke has had lameness troubles as well as skin and ear infections. We also found in Duke’s bloodwork that he was in need of thyroid supplements. Reba has had urinary issues and a few masses that Dr. Faber and Dr. Valentine have surgically removed. We also have been monitoring and treating her liver due to elevated enzymes discovered in Reba’s bloodwork. Overall these two seniors are doing pretty well. They are happy and loving and they always love their meals and especially their morning walks. Other than getting grumpy if they miss their walk or Duke trying to cuddle under the bed covers on a chilly night, they seem to be enjoying their golden years. Thanks to a little help from their family and BCPH Duke and Reba are super seniors!